Allison Dyer Bluemel | FOR Windsor Now! Zane Gourd, 13, and his sister Zharanna, 15, walks through the hop field. Historical Number of Breweries in the U.S. 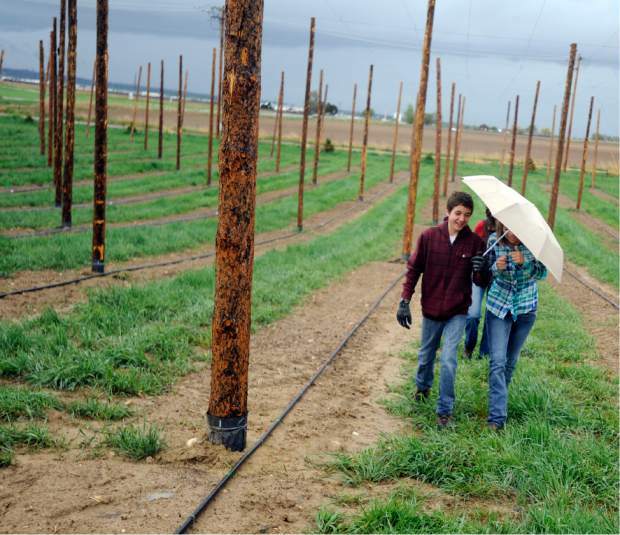 Many find starting something from the ground up laborious, but Windsor residents Jeremy and Tammy Gourd relished in the opportunity to build a better hop infrastructure and started G5 Hop Fields at 11095 Colo. 392 in Windsor. Nationally, hops contributed $33.9 billion to the economy in 2012 but remain a relatively unknown crop to Colorado farmers, something the Gourds hope to change. The venture began when the land’s owner, longtime rancher David Stromberger, offered the Gourds the chance to cultivate hops on a five-acre piece of his land. They jumped at the chance. With Stromberger’s blessing — and the goal of providing hops for northern Colorado’s breweries and home brewers — the Gourds began installing the 304 20-foot poles and 35,000 feet of cable to begin their operation. Most of the labor on the land has been done by the Gourds and their three children — a total of five Gourds which gave them the hop fields’ name — who all have worked to set the fields up to be as self sustaining and organic as possible, Tammy said. “We’re really trying to pioneer a new crop for farmers,” Jeremy said. The operation has attracted attention beyond farmers, however, as commuters often pull over on the side of the highway to observe the rising hop poles, Jeremy said. The couple’s love of brewing began four and a half years ago when Jeremy started growing hops from High Hops Brewery in Windsor alongside their house. “This is a great love and hobby of ours to not only brew at home, but to also see them grow,” he said. The Gourds represent a small number of commercial hop farmers in Colorado, at least they will when they’re two and half planted acres becomes established in a few seasons. 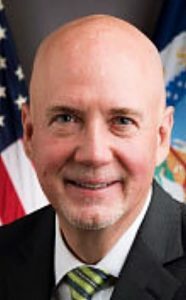 While craft breweries thrive in Colorado — making it third nationally in number of active breweries, barrels produced and breweries per capita — the agricultural climate does not often come to mind for hop growers who gravitate toward the longer growing days of Washington, Oregon and Idaho, said Bart Watson, chief economist of the Brewers Association. The Brewers Association is a national organization resulting from the merging of the Association of Brewers and the Brewers Association of America in 2005. It includes the American Homebrewers Association and the Institute for Brewing and Fermentation Studies. “(Nationally) the hops production has kept up with hop brewing,” he said. However, Colorado falls behind the 38,392 acres of hops produced by the top three producing states — Washington, Oregon and Idaho — in 2014 with only 75 acres of hops in the state, Watson said. In 2012, the top producing state of Washington saw an economic impact of over $1 billion from the craft brewing industry. Comparatively, Colorado’s craft brewing industry had an impact of $1.6 million, according to the Brewers Association. This has caused the price of hops in Colorado to rise due to an ever-increasing demand accompanied by a slower growth in supply, he said. Additionally, the increasing popularity of craft beers that use more hops per barrel — such as IPAs and dry-hopped beers — and the growing home brewing scene puts more pressure on local growers to produce, Watson said. It is under this looming demand the Gourds hope to step up the region’s hop supply, they said. “We want to be able to provide for the northern Colorado breweries as a whole,” Jeremy said. While they hope to see their business flourish, Tammy said they don’t feel fueled by competition with other growers or brewers. The Gourds hope that as their operation grows so will their community ties to other breweries and farmers. “As we move further into the future and continue to build the relationships we hope to satisfy a portion of the demand for local breweries,” Jeremy said. The couple aims to stay true to their home brew roots and membership to the American Homebrewers Association by helping others get into the hobby, they said. Dennis Swingler, president of Treehouse Brewing Club in Greeley, views the Gourds’ fields as a great opportunity for homebrewing in the area, he said. The fields will not only offer a larger local supply for breweries and bring the commercial cost down, but also give hobbyists a more cost-effective way to get hops without growing their own, Swingler said.